Anthony Joshua to fight at Wembley September 22 and again April 13 – will it be Povetkin then Wilder? 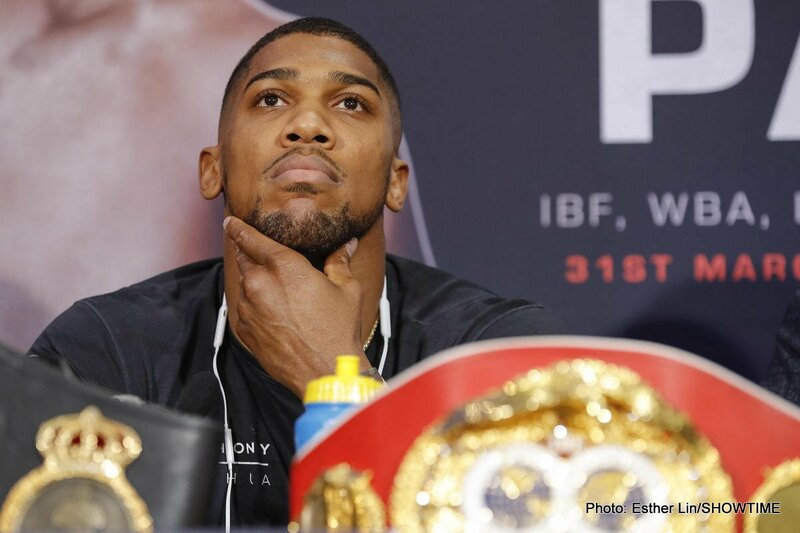 Fight fans may have read how it has been confirmed that WBA/IBF/WBO heavyweight champ Anthony Joshua will box his next two fights at Wembley in London: the next fight on September 22, the fight after that to take place on April 13 of 2019. But so far promoter Eddie Hearn has not confirmed who AJ’s challengers will be. It is of course widely expected to be Russia’s Alexander Povetkin, the current WBA mandatory challenger, next. With the recent talks over a possible Joshua-Deontay Wilder unification fight grinding to a halt, fans are thinking they will have to wait until next year to see this fight go down – if it even does then. With Joshua’s two-fight Wembley deal, Wilder simply has to agree to travel if he wants the fight; that or the WBC champ is willing to wait until some time next summer at the earliest to get it on with Joshua. Has the fact that Joshua is committed to fighting at home for the better part of the next year delayed a Wilder fight even further? Assuming it is Povetkin next for AJ, who will be next if it’s not Wilder? As big as he is, as popular as he is in this country, Joshua can expect two more Wembley sell-outs whoever he fights in his next two bouts. Wouldn’t it be great if Hearn and Joshua surprised us all and announced that a deal has been done for Wilder to come over to the UK to fight Joshua; either in September or in April of next year! If Wilder cannot agree terms, it’s likely he will instead face his own mandatory, Dominic Breazeale, maybe in New York. Joshua at the same time, will be making huge money, far, far more than Wilder will get for a Breazeale defence. But Wilder has said before how money is not the be all and end all to him. We must now wait and see who Hearn officially announces as Joshua’s September opponent, and then await the announcement of his April foe. This of course, is reliant on Joshua taking care of business against the “dangerous” Povetkin. You are here: Home / Boxing News / Anthony Joshua to fight at Wembley September 22 and again April 13 – will it be Povetkin then Wilder?